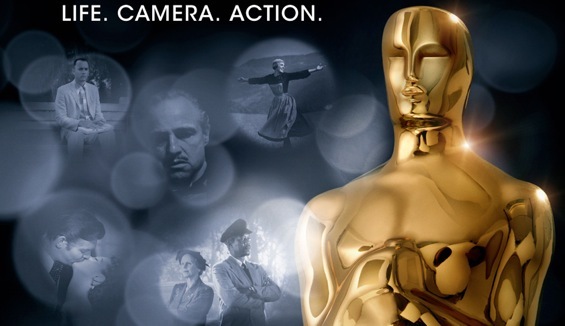 'The Artist' sweeps 5 Oscars at the 84th Academy Awards including Best Film, Best Director, Best Actor, Best Original Score and Best Costume Design. Hugo was not far behind and also managed to bag 5 Oscars. Best Film: Tom cruise presents Best Motion Picture Oscar to Thomas Langmann for 'The Artist'. Best Actress: Colin Firth presents oscar for Actress in a leading role (female) Oscar to Meryl Streep for The Iron Lady. Meryl said, "When I hear my name I see half of America of going aww, not her again! But whatever. I want to thank my husband, colleages, friends. This is such a great honour but friendships, love matter to me more." Merly Gets a standing ovation. Its Meryl's 3rd Oscar. Best Actor: Jean Dujardin wins the Best Actor Oscar for The Artist . He thanks Michel, co-star, wife and cast of The Artist.